Out via the Russian Artificial Sun label is a Die Krupps tribute album titled “Russian Industrial Tribute to Die Krupps”. 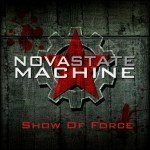 The tribute consists of 23 tracks covered by various industrial bands from the CIS-states. The planned release date for this 2CD is the 31st of July. The first CD of “Russian Industrial Tribute to Die Krupps” is called “Metal Works” and consists of Industrial Metal, Cyber Metal and Industrialized Death Metal tracks. The second CD is called “Electro Works” and consists accordingly of EBM, TBM, Aggro Industrial, Electro Industrial tracks. The compilation will be released on 500 copies and it is available for pre-order on this Bandcamp page. A digital album will be available on iTunes, Amazon MP3, Spotify and others. A video-teaser is online now right here.